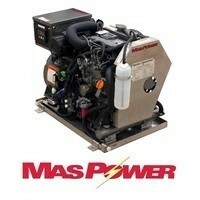 MasPower Marine Generators	There are 8 products. Mastry has provided a tradition of excellence in engine and powertrain applications for over 50 years. A recent acquisition by Yanmar, its major supplier, brought another 100 years of diesel engine manufacturing experience to the table. Mastry's MasPower Marine Generators, powered by Yanmar engines, are built to provide a dependable, quiet, compact and economical source of electric power to expand your boating experience. MasPower MP6M 6KW Marine Generator - 1800 RPM, 3 cylinder. Yanmar 3TNV70 powered marine generator open type unit. Stainless steel drip pan and hardware. Engine mounted monitoring panel, remote panel included, brushless generator, stainless steel exhaust manifold, rubber vibration mounts. Unit mounted AC breaker. MasPower MP6MSA 6KW Marine Generator - 1800 RPM, 3 cylinder. Yanmar 3TNV70 powered marine generator open type unit. Stainless steel drip pan and hardware. Engine mounted monitoring panel, remote panel included, brushless generator, stainless steel exhaust manifold, rubber vibration mounts. Easy to remove panel for Service access, Unit mounted AC breaker. MasPower MP9M 9KW Marine Generator - 1800 RPM, 3 cylinder. Yanmar 3TNV76 powered marine generator open type unit. Stainless steel drip pan and hardware. Engine mounted monitoring panel, remote panel included, brushless generator, stainless steel exhaust manifold, rubber vibration mounts. Unit mounted AC breaker. MasPower MP9MSA 9KW Marine Generator - 1800 RPM, 3 cylinder. Yanmar 3TNV76 powered marine generator low noise output sound shield unit. Stainless steel Drip pan and hardware. Engine mounted monitoring panel, remote panel included, Brushless Generator, stainless steel exhaust manifold, rubber vibration mounts, Easy to remove panel for service access, Unit mounted AC breaker. MasPower MP11M 11KW Marine Generator - 1800 RPM, 3 cylinder. Yanmar 3TNV82 powered marine generator open type unit. Stainless steel Drip pan and hardware. Engine mounted monitoring panel, remote panel included, Brushless Generator, stainless steel exhaust manifold, rubber vibration mounts. Unit mounted AC breaker. MasPower MP11MSA 11KW Marine Generator - 1800 RPM, 3 cylinder. Yanmar 3TNV82 powered marine generator enclosed silent type unit. Stainless steel Drip pan and hardware. Engine mounted monitoring panel, remote panel included, Brushless Generator, stainless steel exhaust manifold, rubber vibration mounts. Easy to remove panels for Service, Unit mounted AC breaker. MasPower MP13M 13KW Marine Generator - 1800 RPM, 3 cylinder. Yanmar 3TNV88 powered marine generator open type unit. Stainless steel Drip pan and hardware. Engine mounted monitoring panel, remote panel included, Brushless Generator, stainless steel exhaust manifold, rubber vibration mounts. Unit mounted AC breaker. MasPower MP13MSA 13KW Marine Generator - 1800 RPM, 3 cylinder. 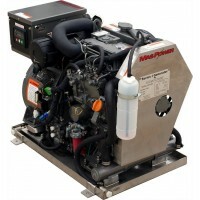 Yanmar 3TNV88 powered marine generator enclosed silent type unit. Stainless steel Drip pan and hardware. Engine mounted monitoring panel, remote panel included, Brushless Generator, stainless steel exhaust manifold, rubber vibration mounts. Easy to remove panels for Service,Unit mounted AC breaker.